the UGC: what is that thing? I noticed something in one of the pots of herbs on the patio as I ate my cereal this morning. Something flourescent green. It was the thing pictured in the photo above, which I find disgusting and fascinating all at the same time. Upon closer inspection, it appears they are a couple of mushrooms. Yet these are not like any mushrooms I have seen before. Not that I'm a mushroom expert or anything, but these are some strange looking fungi. Any idea what sort of fungi they might be? I know, I know...go search google. And I would, but alas, I am sick. Most of my weekend will be spent on the couch with a cup of tea, watching tv. 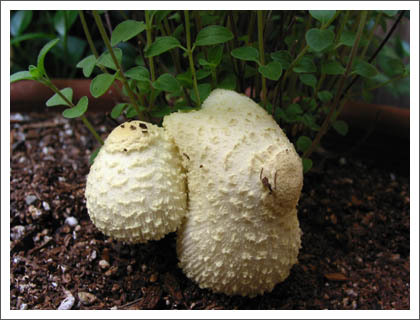 So I invite you to investigate the freaky fungi growing on my patio, if you're so inclined. Please feel free to e-mail me any info you might find. \nCanon Powershot G2\n\nI noticed something in one of the pots of herbs on the patio as I ate my cereal this morning. Something flourescent green. It was the thing pictured in the photo above, which I find disgusting and fascinating all at the same time.\n\nUpon closer inspection, it appears they are a couple of mushrooms. Yet these are not like any mushrooms I have seen before. Not that I'm a mushroom expert or anything, but these are some strange looking fungi.\n\nAny idea what sort of fungi they might be? I know, I know...go search google. And I would, but alas, I am sick. Most of my weekend will be spent on the couch with a cup of tea, watching tv. So I invite you to investigate the freaky fungi growing on my patio, if you're so inclined. Please feel free to e-mail me any info you might find.